That sure does fit within our summer fruits theme. And a great way to stretch them beyond the summer. There is a watermelon in my outside refrigerator. I believe this may be its fate. I could make an entire meal off that and a few wedges of cheese...and a bottle of wine. It's been a wonderful summer season for Bing cherries here in Washington. (But the Ranier cherry crop wasn't very good this summer). We started seeing cherries in early June and they are still coming, albeit thinning out. 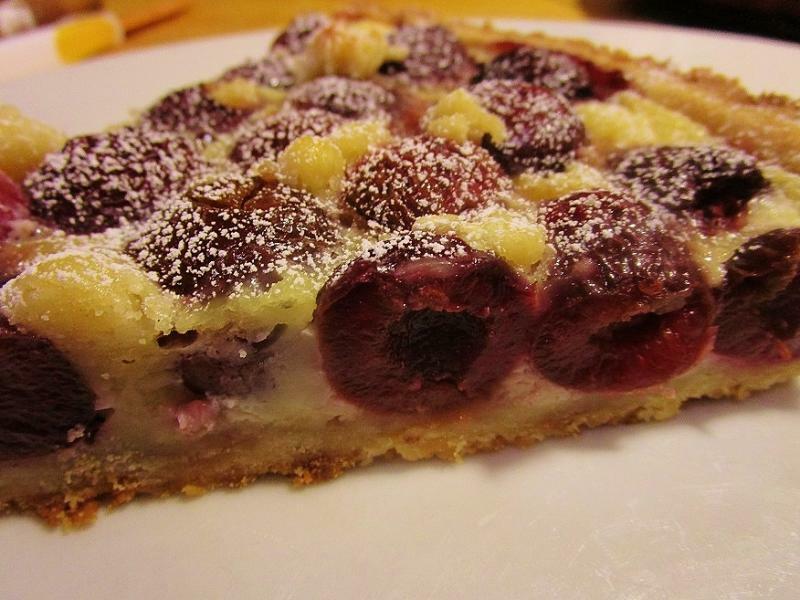 Here's another clafouti, this time a classic cherry clafouti. It's a little different technique than the huckleberry clafouti. 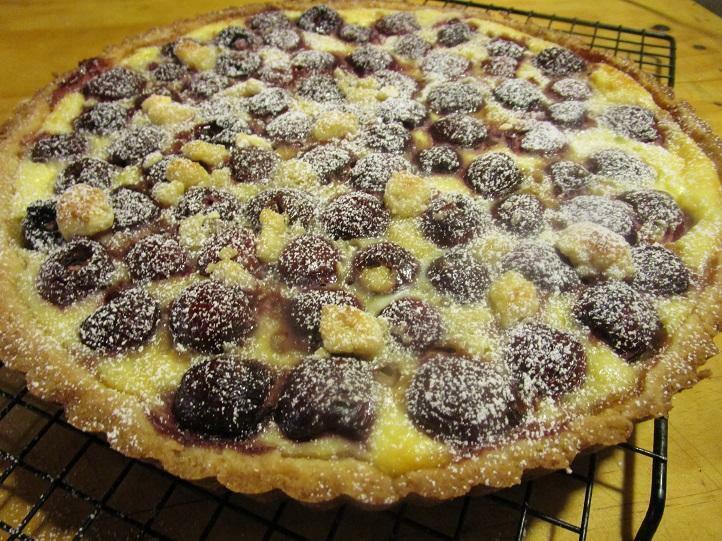 The cherries are soaked in cherry liqueur for a day, then drained, (save the liqueur), tossed with sugar and baked in the oven for about 15 minutes prior to scattering them in the tart pan and adding in the custard. I would give a lot to have a slice of that right now. Very delicious and I prefer it with whipped cream, (but of course ice cream is always good too). David, we may have to agree to disagree. I have a freezer full of xanthan gum and my trusty rotor stator homogenizer. If I so willed I could craft a vinaigrette to remain until the end of time. Instead, as tonight, I liberally pour olive oil and vinegar over my greens and tomatoes. When the salad is gone, I take up a spoon -- if in polite company -- and consume the last visage of the oil and vinegar. Then, and only then, with a sop of crusty bread, I wipe the plate. I'm wondering how I'll prepare my peach dishes. I'm fond of both crisp and cobbler, but my favorite is an old-fashioned peach betty. Just layers of peaches, butter and fresh bread crumbs. Do you have any traditional peach dishes you make every summer? We're in high peach season, and they're wonderful this year. I've been simply macerating them in some sugar, and eating them with yogurt or cottage cheese or on a slab of homemade bread spread with ricotta. Have made one peach cobbler. Will likely make peach preserves or peach jam next week, as I have a half-bushel I picked up at the market today. We were just at a wine maker's dinner and one of the courses in the meal that was composed of everything local was "Joy Road Catering 2-year prosciutto" slices served with peach wedges, zucchini flower fritters filled with a local fresh cheese and edible flowers scattered about. Delicious as was the rest of the meal. Sorry no picture. I was just at the Yakima Farmer's Market this morning and there was a large display of zucchini flowers. Recipe ideas were running through my mind, but the flowers were so delicate I didn't want to subject them to the 3 1/2 hour drive home. And the cooler was already packed with tons of other stuff. The dish you had sure shows how creative and versatile we can get with peaches. A rustic tart / galette. These are wonderful with stone fruit. I don't think anyone has mentioned grilling or pan-grilling stone fruits yet. It's a simple technique, but I'm a pretty simple cook. We've been enjoying nectarines, peaches, plums and pluots grilled over charcoal if I have a fire going or indoors in a pan with a little butter. Just lightly oil the fruit so it won't stick to the grill or melt a little butter in your pan on the stovetop. Either way, they do not take much time. Just enough to soften a little, and it really brings out the flavor and natural sweetness. @Norm Matthewsadded brown sugar to his pan grilled peaches in the dinner thread, but I usually don't add sugar. Either way, it can improve less than perfect grocery store fruit by a lot, and not add a ton of extra calories. I can easily get my husband to eat them this way, and he won't eat a lot of raw fruits and veggies. We had blueberry pancakes as part of a breakfast for dinner tonight. The berries came from Cottle Strawberry Nursery, in Faison, NC. It's less than 90 miles SSE of here. 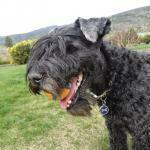 I just love summer for the fruits and veggies! Not so much for the heat and humidity here. Thanks for the mention. I added about a tablespoon of brown sugar to two large peaches. It took the bitter taste out of them without adding much flavor on its own. I did some ripe peaches on the grill last year as a dessert. I might add that the ice cream mentioned in the recipe below is melted ice cream. You could use whipped cream or a scoop of still frozen ice cream but I liked using the melted ice cream as a sauce. reserving the ice cream, mix the other ingredients with the peaches, cover and refrigerate for about an hour. Reserve the syrup. cream and drizzle honey mixture over top. I bought this beautiful box of strawberries, blueberries and blackberries at the Yakima Farmer's Market yesterday. Today I'm doing a pastry with the blackberries. Yakima is in the central part of Washington, in the heart of our State's agricultural region. Typically rhubarb is not in the markets this late, but they had boxes and boxes of bright red rhubarb for sale. I've never tasted a blackberry as sweet and juicy as the berries I found at the Yakima Farmer's Market. Now I'm very envious of the Members that are great bakers and pastry artists--I think of all of you when I attempt to craft pastry. The puff pastry base proved to be too delicate to hold the crème anglaise, so I reverted back to the shortbread crust I used for the cherry clafouti. The crème anglaise was flavored with a hint of lemon and some mint from my garden, then the blackberries on top. No glaze or sugar dusting of the blackberries, just straight from the field, to the market, to the tart. Sweet silver corn and blackberries from the farmer's market. 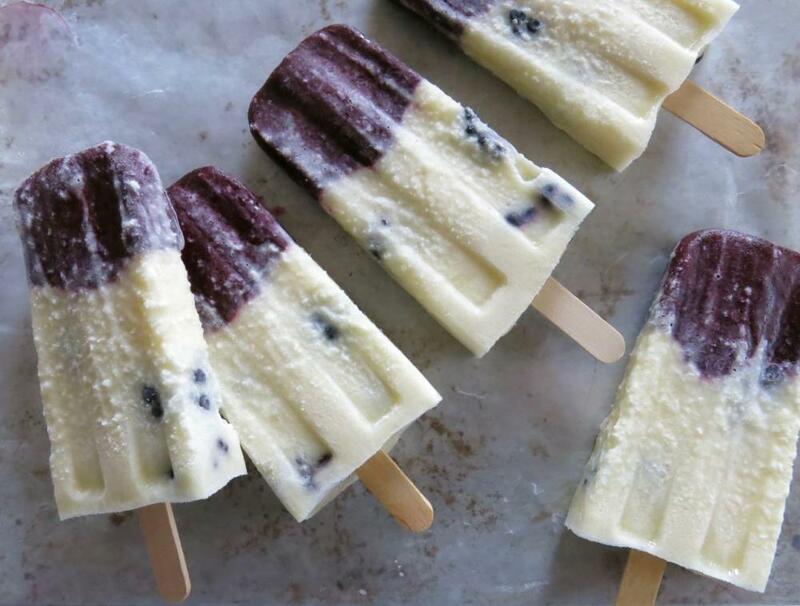 The recipe is from the people's pops cookbook that I reviewed over in the popsicle thread. Nice contrast between the intense sweet-tart blackberry top layer and the sweet, creamy, more subtle corn flavor in the bottom layer. I will be interested whether or not someone would identify it as corn without knowing in advance. They are cosmetically impared because I got distracted while I had the molds sitting in warm water prior to unfolding so they got sort of melty. Thank you, those look delicious and I especially like the creativity of pairing blackberries and corn. Does anyone have a recipe or experience with pickling apricots? I'm toying with the idea of pickled apricots and some type of pork or duck dish. I don't, but I imagine that something like apricot chutney would be really good! Apricot season is long over however, at least where I am located. Great idea. We are still seeing them up here. Lucky you! I love apricots. My favorite baked fruit dish is a Brown Betty. Americans have been making Brown Betty's for generations, and I can attest to how delicious it is. I've been making peach, pear and apple Brown Betty for years. I always wonder how something so humble--fresh fruit, bread crumbs, butter and brown sugar--can result in a dessert that is at the top of the list. Yesterday I made a Peach Brown Betty with local peaches from the Yakima Valley in Central Washington. I blanched them very quickly in boiling water to loosen the skin, then cut into chunks. Then tossed in brown sugar, cinnamon and nutmeg. I always use supermarket white bread to make fresh bread crumbs. Never an artisan loaf, although I am sure it would work fine. The supermarket white bread makes for fine crumbs that soak up the butter and become golden brown and delicate. Oh and lots of butter. Cut a cross on the bottom of each peach and blanch about 2 minutes. Peel off the skin, cut into chunks. In a large bowl combine the peaches, brown sugar, cinnamon, nutmeg and allspice and toss to combine. Layer half the peaches in the bottom of a baking dish, then a layer of bread crumbs, then dot with butter. Add a second layer of peaches, bread crumbs and butter. Bake in a 375 oven for 45 minutes or until the bread crumbs are golden and you can see the peach syrup bubbling. I am reminded of a dessert made by my late mother-in-law which she called Danish apple cake. It was layers of apple separated by breadcrumbs but the breadcrumbs were from a Danish rye bread (rugbröd) and they were fried in butter before being layered. We used to be able to buy Danish rye bread but have not seen it for years. The cake was served with whipped cream. It was quite delicious.